If only you could ask these walls about the people, the emotions, the dramas and the happiness, grieves and joys, pleasures and sins that they have witnessed inside and outside. You will find it all, so many things have happened, in all these years. From once the house of queens and princes to dwelling for thugs, thieves and prostitutes, to then become one of the greatest hotels of the 19th century in the old city, from luxury to lust these walls have seen it all. Built in 1714 as private housing for Lady Pauna and her sons, by the regent Stefan Cantacuzino, it was considered one of the loved places to which to retreat from all the agitation and problems of the court, a personal sanctuary for the blue blooded family. Sadly this sanctuary never helped the builder itself as he met his faith in 1716 in Constantinople. femeie After 1795 when the court was moved to Spirei Hill, the entire area became a prolific red light district with all it’s attributes, a place for carnal delights and lust beyond one’s dreams. Walking these very streets a sense of hidden pleasures could be felt in the air. In 1847 great fires overtook the city. 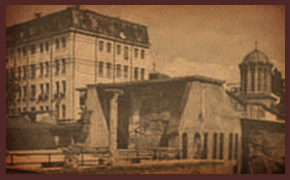 As a result most of the buildings were badly damaged, yet after all the destruction, an opportunity came forth, rebuilding and improving.In 1857 The Fieschi Hotel opened right here, one of the best in the city, and in 1874 the reconstruction of the area was finalized. So many things have happened; so many faces have watched the very place you are now sitting on. A testimony to emotions you can almost touch. Inside these very walls, along the thoughts of past and future, take your time and let us entertain your tastes, with drinks from all over the world, and a cuisine you will not find anywhere else but here. We believe that taste matters more then quantity, and for that along the drinks you will find our tapas menu, great tastes in smaller quantities. You can have what you want, when you want without restrictions. locatie Opened in 2009, Bordello is one of the best known pubs in Bucharest, over it’s time it has received various awards for it’s sustained development, offer, originality, service and communication. 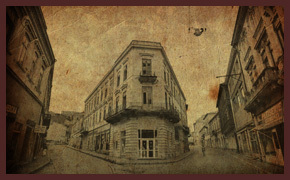 It is now the most awarded bar in Romania. It is a place of life, a place to enjoy yourselves every day of the week. The venue is structured in 3 separate, yet related, spaces. The Pub downstairs is the friendly, open space in wich to spend a casual afternoon or a late evening surounded by great music and people. 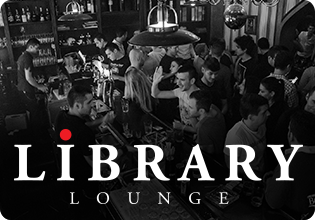 The Library Lounge upstairs is the more intimate, less crowded area, perfect for celebrations and private events, a must have when out in the city. 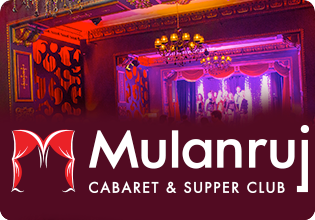 Last but not least is the Mulanruj Dining Theatre, the unique cabaret, the shows, the space itself breathes “special”. Suited for when you want a unique experience, no matter if a date, a dinner, a meeting Mulanruj will amaze you.Now go ahead and browse our website, you will find all the needed information, and if by chance you don’t we are allways available for contact. 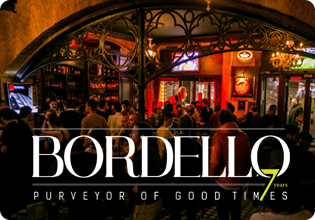 Welcome to Bordello, it’s all about the feeling! Discover all 3 Sides There is always something going on at Bordello. Each side it is available for you to connect with, the friendly Pub, the intimate Library Lounge or the flamboyant Mulanruj.